The former Kilmachalmaig school stood on this site from a record from 1772. The school was funded by the Society for the Promotion of Christian Knowledge and in 1802 it had 75 pupils. It was one of 15 such schools in the parish of Rothesay. In 1845 the school moved to Kildavanan . At this time it is thought that the use changed to a blacksmiths with the original schoolroom now being used as the blacksmiths workshop. A building widely believed to be one of the oldest surviving examples of Bute’s rural heritage is to be put on the market. The Grade B-listed Ettrick Smiddy and adjoining house have never changed hands before, despite being more than two hundred years old. The Mount Stuart Trust is to sell the property - with a guide price of £100,000 - after declining to pursue a suggestion that it be turned into a museum. Bute Estate factor Bob Baines said the future of the building had been discussed at length within the Trust ever since it became vacant a couple of years ago. “The Trust has looked at many different possible options for the house and smithy and explored various suggestions put to it, all of which presented a significant commercial challenge,” he added. “Over the same period the Trust has received interest from a number of different parties, including other island-based charitable bodies, which had their own ideas about the building’s future. The building comprises a two bedroom cottage and adjoining former workshop, where several generations of the Thomson and Smith families plied their trade as country blacksmiths over nearly two centuries. It was the last of seven working smiddys on Bute, providing farms in the area with custom-made equipment and repairing their broken machinery. However, the arrival of tractors on the island in the early 1940s sounded the death knell for country blacksmiths, and the Ettrick smiddy finally closed its doors to customers in 1949. Addressing the suggestion that the building be used as a museum, Mr Baines said: “The Trust looked at this option very carefully, as it has at all others put to it over the last few years. “However, developing the property into a museum was assesssed not to be an opportunity the Trust wanted to pursue due to its questionable commercial viability. “Putting the building on the open market will provide all interested parties with the opportunity to test the feasibility of their ideas for its future and seek to put them into action. Almost lost in brambles at the former Ettrick Smithy, St. Colmac, Isle of Bute. The pump has lost its handle and cap, but closer inspection reveals that it has a lining, possibly of gunmetal. 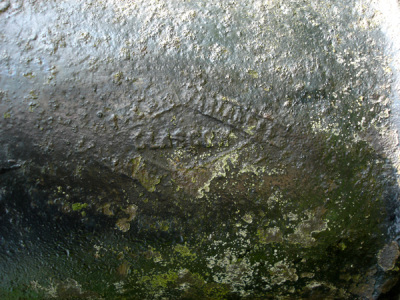 Markings: "WALTER MACFARLANE SARACEN FOUNDRY GLASGOW". Manufacturer: It's a Macfarlane No. 1 Pump. "IT'S like being transported back in a time machine two hundred years," someone whispered, as the fire at the old Ettrick Smiddy was lit for the first time in more than half a century on Saturday. The smiddy, a short distance up the road from Ettrick Bay, is probably the oldest surviving example of Bute's rural heritage. A family line can be traced from John Thomson, who lives there now at the age of 85, back through at least four generations of country blacksmiths who plied their trade in a building which easily dates back to the 18th century. And, courtesy of Mr Thomson, Bute Vintage Club and two very talented young farriers, the smiddy came alive on Saturday for the first time since 1949. The farriers were David Varini and Devin Crerar, both trained at the leading farrier's company of J. & A. Ferrie of Newmilns. They demonstrated the art of horseshoe making and shoeing using the smiddy's own fire and anvil in front of a fascinated audience - recreating the bustling atmosphere of 18th century country blacksmith's shop. On display on one of the smiddy's walls were photographs of the men who used to live and work at the smiddy, along with examples of the traditional blacksmith's craft. Throughout the day a bustle of engrossed visitors watched the two farriers make a horseshoe from start to finish, and witnessed Kendal, Marion Sayers' large piebald horse, having its shoes removed and being re-shod in the same way horses were shod in the 1700s. The man who did most of the organising for the event was Ian Sinclair who, in a speech of thanks, said: "This is a long held ambition for me. "Until today, hardly anybody knew what lay behind the doors of this building, which ceased to operate as a smiddy 50 years ago. "There's an unbroken family chain here which is as old as the smiddy itself." John Thomson, who lives there today, is 85 years old now, and his father, Bryce Thomson, who lived to 94 and died in 1986, was the last blacksmith to work the old smiddy. Bryce Thomson came here in 1907 to serve his apprenticeship under John Smith, before going to work in Broxburn during the First World War to make shoes for mules. On returning to Bute, Bryce went to work for Rothesay's leading farrier at the time, Andrew Baird, in the High Street, and married John Smith's daughter Catherine. John was born in 1864; his father, Peter Smith, was born in 1828 and his father Duncan in 1795. Peter is the first known blacksmith at the Ettrick smiddy, though it's more than likely that Duncan was a smith too. Recalling his own memories of the days when the smiddy still worked, John Thomson told us: "There used to be seven blacksmiths on the island, and this was the last one. "It's still the last that's workable. It hasn't changed at all since it was last used in 1949. "There were two fires in there at one time and half a dozen men working. All the farms in the area had their equipment made and repaired here, and had their Clydesdale horses shod here. They used to have to show cartwheels too. "When my father was an apprentice here all the traffic was milk crates travelling along the roads from the farms at five in the morning. "They would stop and throw stones on to the roof to wake my father up to put studs on their horses' shoes to stop them slipping on the icy roads in winter. "If you were a farmer - well, you name it, if you wanted a bit of machinery made or repaired you went to the country blacksmith. "But tractors started on the island in the early 1940s and that really did away with the country blacksmiths." That march of technology makes it all the more remarkable that a traditional blacksmith's shop like the Ettrick smiddy should survive, virtually intact, into the 21st century. 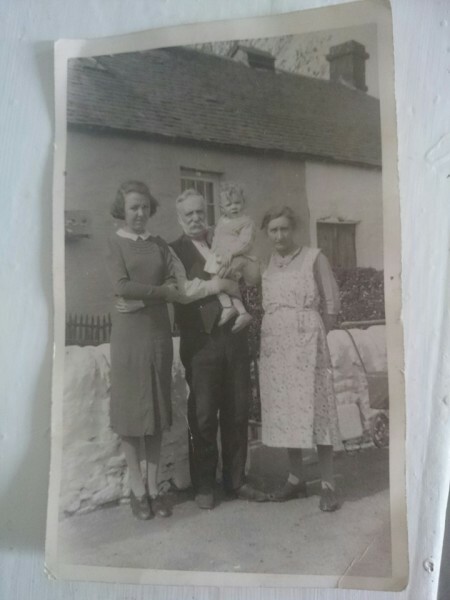 We had a vistit from the niece of the cottages last occupant , John Thomson , who told us some stories of how her father and her uncle John used to sit by the fire in the main living room and played the fiddle on a Saturday night. She also told us that the byre which is now our kitchen was where the last blacksmith , Bryce Thomsons , sister used to store the deck chairs that she hired out at Ettrick Beach in the summer. A local lady whom we didnt get her name sorry , stopped for a chat and told us of how when she lived in the local farm , they used to be sent down to the Smiddy to get cigarettes ! Apparently the lady who hired out the deck chairs , also sold sweets and cigarettes and if the locals ran out , they would do down and chap the door and be sold them from out the byre ? We have been told that , during the big winter shoots organised by Lord Bute , they would use the Smiddy as the venue for their lunch. The forge was lit and stoked up and all the shooters would come in for a heat and have lunch.